It’s never been a secret that Facebook is a data hungry monster, and I have always acted in that knowledge. There are reasons why FB is valuable as a tool for me, there are a range of others why FB is all wrong. Feeling increasingly uncomfortable, it is time to create a path for myself away from it. I am not leaving, at least not completely for reasons following towards the end of this post. I did however deactivate my account last night. This means my data is still available within FB but invisible, and logging in will reactivate it all. In short, I am not going cold turkey on FB, but merely semifreddo, half cold. I expect that removing myself from FB for now creates the space for me to figure out what to do and not do with FB. I joined FB in the first week of October 2006, shortly after it became available for non-US non-academic e-mail accounts in September. Until the winter of 2013 I posted virtually nothing, except automatic links to my blogposts. Only from November 2013, nudged by Gerrit Eicker, I started interacting with FB more, and from early 2014 the number of postings slowly grew. It turned into an addictive habit, that you really want to quit but don’t really seem to be able to. A tool I use to track my own software and web-usage has been brutally direct in showing me how much of a time sink FB became. I removed the FB app from my phone at some point in the last year, mostly to cut away the noise and disconnect from the here and now that doing a quick FB check during ‘empty’ moments creates. it allows me to stay in touch with a wide variety of people that I otherwise wouldn’t be in touch with. Because they are distant in terms of geography, because the context we once shared is a long time ago, the current overlap in context is small, or any combination thereof. It makes keeping a sense of what’s going on in their lives pretty effortless, and even if actual interaction may be low, it serves as a low threshold channel to emphatise. It allowed me to share things in a much less public place than my blog when in 2015 and 2016 personal events were dominant, without the need to reach out directly to anyone. This allowed others to respond as they see fit. In some instances FB is the only way I can easily connect to people and groups I am professionally connected with, such as for instance colleagues in Central Asia, or the Serbian open data community. Over time it became clear to me that the endless FB timeline has de facto replaced my carefully calibrated rss-based information diet. What were my intentional and purposeful acts of keeping in touch, learning and informing myself, got replaced by a steady stream of distraction and procrastination. Starting from a question, and then seeking out what might be relevant mostly disappeared, at best responsive but often passive consumption replacing it. There’s a distracting quality to FB as a gateway to material even when interacting with the same content: I follow some thinkers/authors in my FB network, but end up engaging with whatever they posted today, rather then diving deeply into their actual work available on their own sites. It’s almost as if I have to remind myself that doing online deskresearch or literature review isn’t checking out the FB timelines of the people in that field. To large swathes of the global population FB serves as a facsimile of the internet, hiding the potent agency-inducing qualities the internet actually has, and merely presenting the passive and consumer side of the net. As long as you keep scrolling down your timeline you’re not taking action (even if changing your avatar to show sympathy with one plight or another gives you that feeling). Although I’ve succeeded in preserving a certain variety in my FB network, so that regularly I get presented with viewpoints or articles which clash with my sense of what is common (not: common sense), FB has been busily building my own bubble around me. This is readily apparent whenever I venture into other places, darker places, following links on the profiles of friends of friends of friends further and further outside my ‘regular’ network. The resulting suggested articles and ads that fill my timeline for days afterwards are a shocking view on what others apparently get presented as their day to day diet. At issue here is the enormous asymmetry. It is infinitely easier to automatically feed me dross, aim to manipulate my choices in a myriad of ways, then it is for me to purposefully individually and manually resist that (if at all psychologically possible). FB, or actually anyone paying them, can without effort suggest 100s of articles and ads, an individual will get fed up manually hitting ‘show me less of this’ after less than a dozen times. A second layer of asymmetry is that none of the pattern matching or categorising you and I are subject to are in any meaningful way available to us ourselves. This isn’t about the personal data we consciously share (e.g. dates of birth, phone numbers, postings), but about our actual behaviour on the platform, the things I and my connections hit like for, the links we click, the time we spend engaged with those links, the comments we typed in and ultimately decided not to post, the frequency with which we yet again open up the timeline to see if we get a little bit of endorphins from being ‘liked’, our responses to the A/B testing done on us unawares ,etc. etc. On top of all that, similar to the tobacco industry, FB really likes to keep you hooked. Over the years I’ve deleted accounts from dozens if not hundreds of services. Some will say “we’re really sorry to see you go”, or ask you to reconsider, or make you type a confirmation manually (“DELETE”). 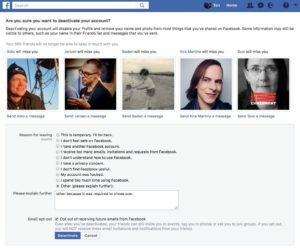 FB however appeals to your emotions like no other, saying ‘oh but this or that person will miss you so much!’ and force you to provide a reason to leave, and even then ask for another confirmation after all that. That’s just for de-activating the account, leaving everything still there. Re-activating merely requires logging in, yet another designed asymmetry. I wonder what they will do when I actually would to delete the account. Aldo will miss me, Jeroen will miss me, Baden will miss me, all 660 of my FB friends will miss me,……please stay! Yes, I’m sure. FB has to be removed as a time sink and obstacle to purposeful interaction. In terms of information intake it means going through my network list (I downloaded my FB data), and find other ways to keep track. In terms of sharing, my blog (which is fully public, so very different questions apply concerning what to post or not there) will need to have prevalence, likely augmented with some other tools. I can see running my own Diaspora-pod (or another distributed FB simile), and inviting selected groups into specific instances. This replaces the single humongous space that is used for all group interaction in FB, with more group and community specific ‘town squares’. Having the right spaces for interaction is an important aspect in community health, and FB is not designed like that. In terms of interacting it means looking at my network list and more frequently purposefully reach out. Yes, that’s more time consuming, but more rewarding as well. Since my friend Peter left FB, the frequency of being in touch has risen I feel, and the quality and awareness of it has definitely increased. Although it won’t scale to all other connections. Ensuring using FB more deliberately is another element. There are those I’m only connected with there. There are those I’m only professionally connected with there. So for them I will likely retain my account. For some Messenger is the only tool we share, and that too requires keeping the FB account. But like going to the pub, visiting FB will need to be a planned and time-boxed thing, and no longer the ‘filler’ of small periods of time. This is the ‘quitting smoking’ part of FB, all the ‘quick ciggies’ during the day. Any return to FB will be like a none-smoker entering a venue where smoking is allowed. 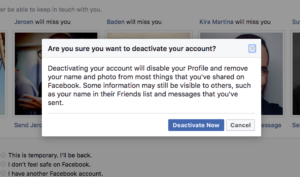 For that more purposeful and limited interaction, my entire FB history is of no importance, so deleting that is a logical step.